United States Paper Currency Auction — Harritt Group, Inc. Shipping available at buyer’s expense. This portion of the Phyllis Bart Estate Absolute Auction will be sold via simulcast auction. Bid in person on-site or online using your favorite device. Pre-Bids are being accepted now and the online bidding room will open 1 hour prior to the start of the sale. Items will be sold in the order listed below. 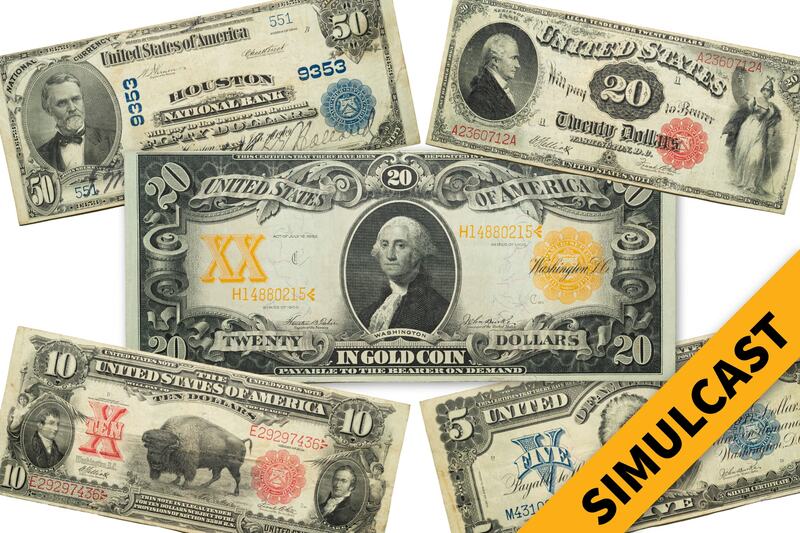 Simulcast items include thirty-eight (38) notes, tenders, silver certificates and gold certificates in large and small size, fractional, postage and others. Place a pre-bid (absentee bid) online up until 1 hour prior to the start of the sale. Bid online during the live sale using the mobile, tablet, or web auction platform. Bid in person, on-site during the live sale. The good ol’ fashion auction way. Lewis & Clark Parkway to Eastern Boulevard. South 1/2 mile to left at light on Windemere Drive to left on Keswick Drive to left on Grasmere Drive.